The new Exile building at 13th and Reed looks as if it had always been part of the neighborhood. Architect Vincent Mancini grew up in South Philadelphia, the son of a bricklayer, and he still does the bulk of his design work within walking distance of his childhood home on Tasker Street. The upside is that he knows everybody. The downside is that his father, now 92 and retired, will often stop by a job site to offer his two cents. Construction quality being what it is these days, his critiques can be harsh. “He looks at some of them and makes the sign of the cross,” Mancini told me. Mancini’s firm, Landmark Architectural Design, just wrapped up its latest project, a three-story apartment house at 13th and Reed, and this time his father’s reaction was different. The building, which sits across the street from Columbus Square, appears at first glance to be remarkable only for its ordinariness. It’s reminiscent of the kind of vintage office block you might see on the main street of a small town, or perhaps an old factory that has been converted to housing. But unlike so many new buildings in Philadelphia, which feature hard-edged, monochrome bricks and panelized veneers, the bricks here have soft edges and a mottled rose coloring that almost glows. They were laid by hand, by actual bricklayers, and the facade is incised with the traditional architectural details that elevate a simple wall from blank canvas to the realm of art: arched windows, crisp piers and brick lintels. This time, when Michael Mancini came to inspect his son’s work, the gesture he made was a thumb’s up. The Exile Building is fully embedded in the neighborhood and will have a cafe and theater entrance facing Columbus Square. I was also impressed with the results. There is no doubt that the project’s aesthetic trades on the past, as well as the current vogue for industrial-inspired spaces. But when you consider that modern design in Philadelphia has come to mean boxy buildings covered in flat, repetitive expanses of metal and glass, a well-made traditionalist design starts to look good by comparison. Quality craftsmanship never goes out of style. There may be a larger lesson here. 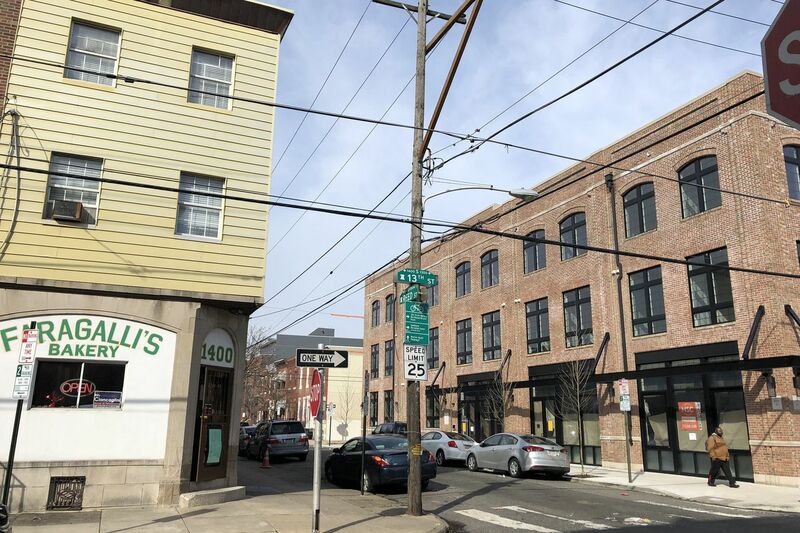 The decision by Ostroff and his partner Mickey Murray to invest a pleasing design and real craft has gone a long way toward softening the Nimbyish tendencies of the parking-obsessed South Philadelphia neighborhood. Even though the 24-unit building has no on-site parking, it received the neighborhood’s enthusiastic support at the Zoning Board hearing. While the developers didn’t need special permission to build the apartments, which come in under the 38-foot height limit, they did have to obtain a variance for a 125-seat theater, the new home for Theatre Exile. A large gate along 13th Street marks the entrance to Theater Exile's courtyard and lobby. It’s one thing for a smallish apartment building to go up in Philadelphia without a battle over parking and density. A theater is another matter. It helped that Theatre Exile was a known quantity in Passyunk Square. The theater had been a tenant in the two-story warehouse that previously occupied the site, although it operated in a smaller venue that held only 60 people. “There was some nail-biting over the theater,” Anton acknowledged, but “people loved them so much,” they agreed not to make an issue over the potential competition for street parking. Anyway, many patrons are likely to come by ride-share, taxi or subway. Because the facade isn’t broken up by a driveway or parking lot, the building is able to participate fully in the life of the neighborhood. The corner overlooking the park has been fitted with large windows for a cafe. Theater-goers will be able to grab a light meal before heading to the show. You enter the theater compound on 13th Street, passing through a decorative iron gate into a generous courtyard that leads to an elevator lobby. The black-box theater, designed by Cecil Baker + Partners, is in the basement. Because Theatre Exile needed 17-foot ceilings, the developers had to dig extra-deep foundations. “It looked like we were building a foundation for a skyscraper,” Ostroff said. The excavations added to the project’s costs, as did the good-quality brick, but the investment enhanced the project’s luster. The developers are calling it, The Exile Building. For Mancini, whose design record includes the much less attractive Armory Loft Apartments at Broad and Wharton, having a developer willing to splurge made all the difference. It was Ostroff and Murray who first suggested that Mancini and his partner, Agata Reister, take their cues from early 20th century warehouses. Rather than use a typical, dark red Philadelphia brick, they went with a lighter, tumbled Charlton Rose, so the apartment building wouldn’t overwhelm its rowhouse neighbors. A classicist at heart, Mancini marked the building’s base and the crowning entablature with limestone-colored coursing. And unlike many new apartment buildings, three sides are faced with brick. A steel canopy adds a slightly modern touch. The crisp detailing on the brick piers help bring this simple building to life. The design recently caught the eye of a short-term residency hotel called Domio. It has offered to lease the entire building from the developers. But for that to happen, he would need to obtain yet-another zoning variance. In this case, a hotel would defeat the effort to diversify Passyunk Square’s housing stock by adding rental apartments. After the success of Landmark’s design, Philly Living is also proposing a larger version for 24th and Washington, where he controls the better part of a city block. Not only would it have 80 units — a mix of apartments, duplexes and townhouses — the facade along Washington Avenue would span most of the block. Noah Ostroff and Landmark Architectural Design are working on a second, faux-factory design for 2401 Washington Ave. The 80-unit project includes an apartment building on Washington Avenue and townhouses facing Kimball Street. The mixed-used building at 2401 Washington Ave. includes an internal street that separates the apartment building from the townhouses. Except for a few small changes, like larger windows and terraces, the proposed apartment house is essentially a stretched-out version of the Exile Building. Landmark changed the placement of piers to vary the rhythm and break up the long expanse, but more study is needed. Same for the vaguely New Orleans-style terrace railings and the driveway entrance off Washington Avenue. Yet, even with these flaws, the brick building is still much preferable to the metal clad Lincoln Square at Broad and Washington. Landmark’s warehouse aesthetic has worked in these two projects because it is so much like the Philadelphia vernacular. The attention to craft and the brick flourishes are the city’s hallmark. You wouldn’t want to see it repeated everywhere. But you could do much worse. Let’s see what Mancini’s father says. The basement theater was designed by Cecil Baker + Partners.